I’ve been enjoying Under Western Skies 3: Environments, Technologies, Communities, which has featured a wonderful array of critical environmental theorists and practitioners — including among its keynotes Justice Thomas Berger (whose 1978-8 Mackenzie Valley Pipeline Inquiry Report was a classic of environmental legal innovation), the indigenous activist group Idle No More, historian and Center of the American West director Patty Limerick, religion and environmental scholar Bron Taylor, anthropologist Tim Ingold (speaking in a few moments), Winona LaDuke (tomorrow), and others. But one of the unexpected revelations for me has been Brenda Longfellow’s Offshore, an interactive web documentary that offers powerful depictions of the aftermath of the Deepwater Horizon Disaster in a stunning visual format. The film’s home page is here. I recommend setting aside some time to explore its many features. Note that the page takes some time to load. For those wishing to follow the conference, its Twitter hashtag is #uws2014, and the Facebook page is https://www.facebook.com/uws2014. I will try to say more about it when I can. 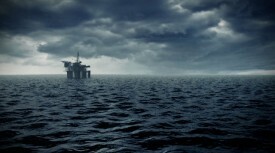 OFFSHORE: Prologue from Helios Design Labs on Vimeo.